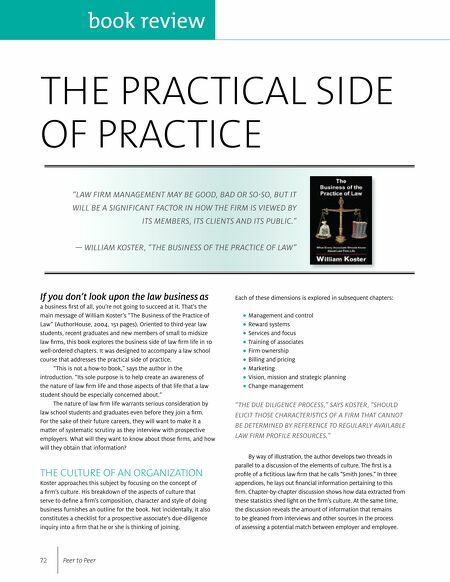 book review The Practical Side of Practice "Law firm management may be good, bad or so-so, but it will be a significant factor in how the firm is viewed by its members, its clients and its public." — William Koster, "The Business of the Practice of Law" If you don't look upon the law business as a business first of all, you're not going to succeed at it. That's the main message of William Koster's "The Business of the Practice of Law" (AuthorHouse, 2004, 151 pages). Oriented to third-year law students, recent graduates and new members of small to midsize law firms, this book explores the business side of law firm life in 10 well-ordered chapters. 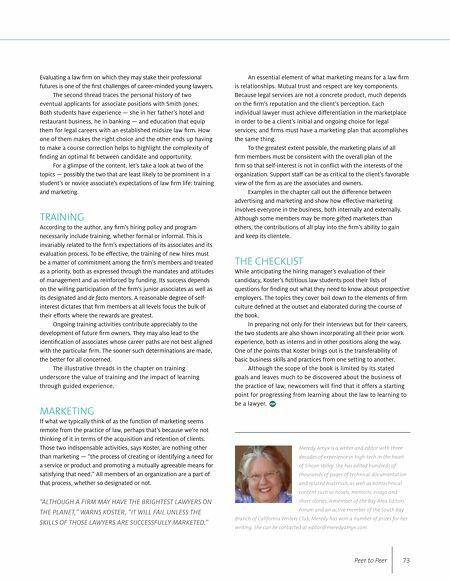 It was designed to accompany a law school course that addresses the practical side of practice. "This is not a how-to book," says the author in the introduction. "Its sole purpose is to help create an awareness of the nature of law firm life and those aspects of that life that a law student should be especially concerned about." The nature of law firm life warrants serious consideration by law school students and graduates even before they join a firm. For the sake of their future careers, they will want to make it a matter of systematic scrutiny as they interview with prospective employers. What will they want to know about those firms, and how will they obtain that information? The Culture of an Organization Koster approaches this subject by focusing on the concept of a firm's culture. His breakdown of the aspects of culture that serve to define a firm's composition, character and style of doing business furnishes an outline for the book. Not incidentally, it also constitutes a checklist for a prospective associate's due-diligence inquiry into a firm that he or she is thinking of joining. 72 Peer to Peer Each of these dimensions is explored in subsequent chapters: • Management and control • Reward systems • Services and focus • Training of associates • Firm ownership • Billing and pricing • Marketing • Vision, mission and strategic planning • Change management "The due diligence process," says Koster, "should elicit those characteristics of a firm that cannot be determined by reference to regularly available law firm profile resources." By way of illustration, the author develops two threads in parallel to a discussion of the elements of culture. The first is a profile of a fictitious law firm that he calls "Smith Jones." In three appendices, he lays out financial information pertaining to this firm. Chapter-by-chapter discussion shows how data extracted from these statistics shed light on the firm's culture. At the same time, the discussion reveals the amount of information that remains to be gleaned from interviews and other sources in the process of assessing a potential match between employer and employee.